White-lacquered interior door with a relief-like surface KAISERline – R71L, white-lacquered | LIP BLED - a touch of nature in your home. Let us know if you have any questions or preferences. Your opinion is important to us. 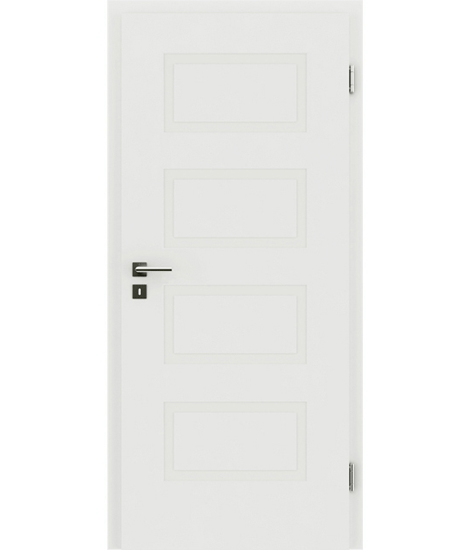 Every interior door consists of a door leaf and a door frame. On the following pages, you can chose between numerous edges, door leaf constructions and different forms of door frames. Certified functional doors (SECURAline) for apartments that stand out due to their sound insulation, climate resistance, smoke protection, anti-burglary protection and fire protection. An individual approach to each project is our trademark. We provide overall solutions for hotels, (holiday) apartments, mansions and offices. Since our approach is very individual, we meet the requirements of even the most demanding customers. All products are manufactured according to our customers’ wishes and requirements. For further informations and details please consult our sales personnel. The sales programme may vary from country to country and is specified in the sales price list. Find your nearest lipbled sales outlet.